Prototype: Acid transport car with a brakeman's platform for transporting hydrogen peroxide. Privately owned car painted and lettered for Degussa, used on the German Federal Railroad (DB). The car looks as it did in Era IIIb around 1959. Car number 546 328 P.
The transport of (dangerous) chemicals was among the tasks taken on by railroads early on in the Industrial Age. Hauling corrosive or poisonous substances naturally required special measures. So-called acid transport cars appeared rather early as special cars for this purpose. They hauled more than just acids such as sulfuric acid, oleum, hydrochloric acid, nitric acid, hydrofluoric acid, and phosphoric acid. They were also used to haul other aggressive substances such as concentrated lyes or strongly oxidizing chemicals such as hydrogen peroxide. Here the railroad had almost a monopoly, because most of these liquids were not allowed to be transported by road for safety reasons. Stoneware containers were chosen to haul these dangerous materials, because stoneware itself resists the most powerful acids, as the alchemists already knew. 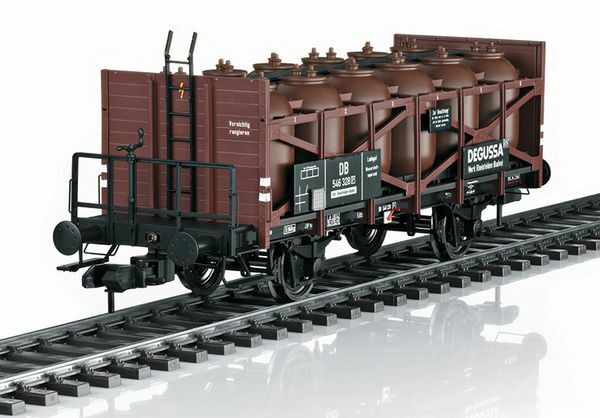 Initially, the stoneware containers were simply loaded on gondolas or boxcars. Soon it was recognized that the containers were steadier mounted on the cars, and the acid transport car was born. These containers could no longer be emptied by pouring out the contents and therefore had to be emptied with compressed air. The construction of acid transport cars demanded specific structural safety measures. The car floor therefore consisted of wooden boards painted with asphalt and had to be inclined to the side sills of the car in order to allow leaked acids to flow away. The containers were mounted below with tarred wooden pieces in such a way that they could not be shifted under any circumstances. Above there was a steel holding frame that also supported the catwalk for handling operations. Acid transport cars were considered so-called cautionary cars. They always had a brakeman's platform with a handbrake and they were not allowed to be operated in hump yards or on hump tracks. 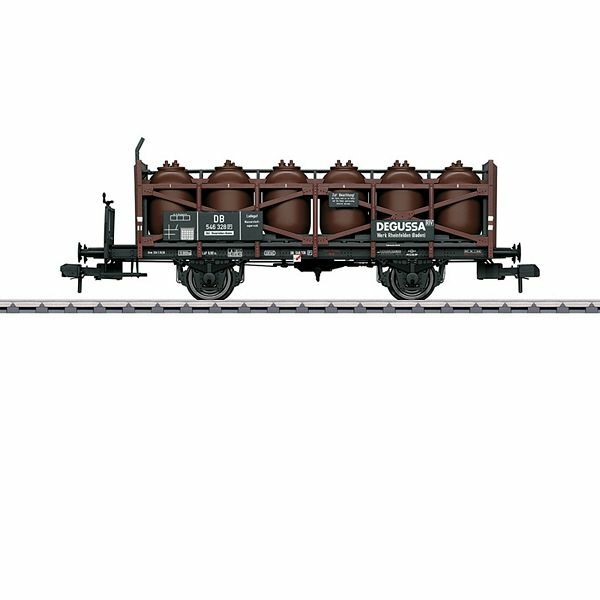 The acid transport cars as a rule were equipped with 12 stoneware containers of 1,000 liters / 264 gallons each, which soon bestowed the nickname on them of "Twelve Apostles Car". As a rule, acid transport cars ran as privately owned cars of petro-chemical firms such as Degussa for transporting hydrogen peroxide. They survived up to the start of the Nineties on German railroads.